I woke up this morning and asked the DH what he’d like for breakfast, oatmeal pancakes or sour milk pancakes. He said oatmeal. 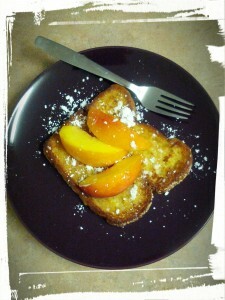 Then I looked at what I had in the kitchen and decided we were having French toast. Executive decisions. I make them. I went to a farmer’s market yesterday with a friend and picked up a lovely loaf of egg bread. I think it may have been somewhat mislabelled, because it was really more of a brioche loaf than egg bread. I realized this when I made myself a sandwich with some smoked mozzarella that I had picked up on the same shopping trip, and then also tried to make myself an open-faced bocconcini and grape tomato sandwich. (It was a successful shopping trip for a foodie, can you tell?) But the bread was just a tad too sweet for a hearty sandwich. 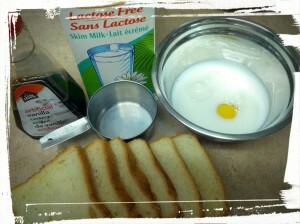 Mix up eggs, milk, and vanilla. Melt butter in a frying pan on medium to medium-high heat. Dip bread in the mixture and fry until each side is golden brown. Sprinkle with icing sugar and sliced fruit, or whatever you have lying around. Impress family. Eat. 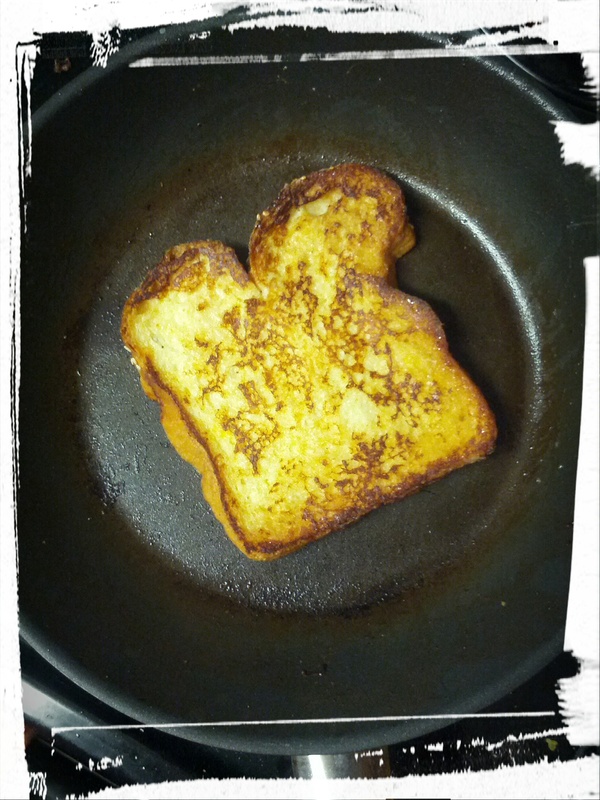 Frying me up some French toast! After I cooked it all up, I thought that adding a bit of zested citrus might have been a nice touch, so I recommend that. The DH decided that melted smoked mozzarella would be a nice touch, so he enjoyed that, while I looked on, askance at the mixing of sweet and hearty. 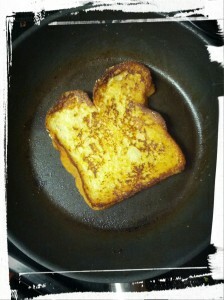 Do you have any French toast variations that you like? Let me know in the comments! Et voila! It’s breakfast, baby! 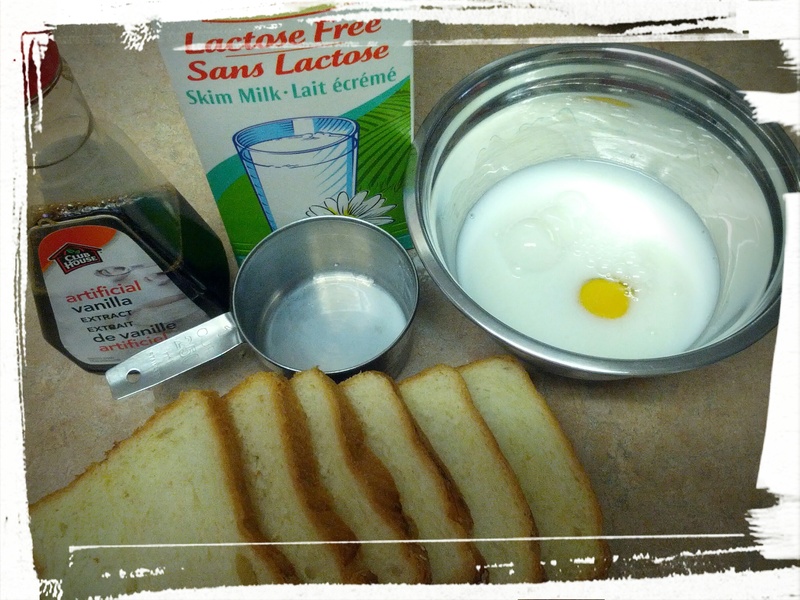 This entry was posted in Breakfast Foods on August 31, 2014 by Margaret.